Multiple field visits were completed by BM Geological Services (BMGS) to gather additional data for the purpose of constructing the Conceptual Exploration Target (the Target). Outcropping vein geometries were mapped and measured in detail with emphasis placed on paragenesis of mineralisation. Field observations identified that phases of mineralised quartz veining are located within low stress, dilatational jogs caused by the reactivation of a regional scale reverse fault (Tollu Fault) (Table 1). 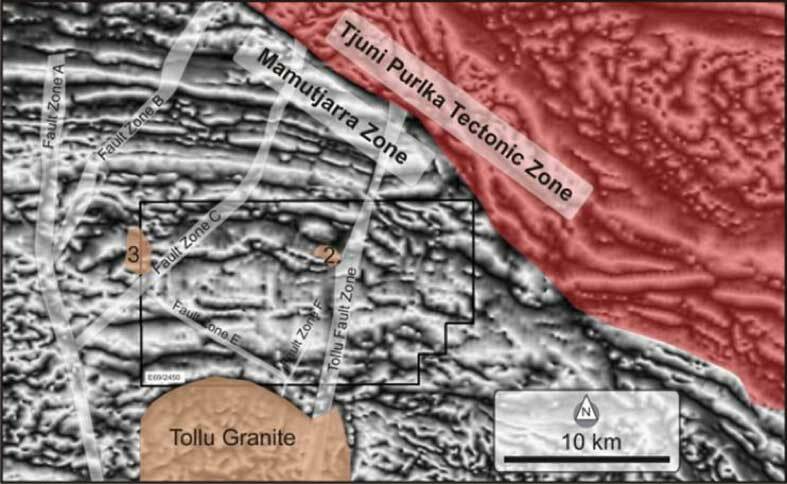 The Tollu Fault has been interpreted as a deep-seated transform structure of the NW-SE striking Tjuni Purlka Tectonic Zone situated to the north (Figure 1). An early, uniform, phase of veining appears to be related to an initial structural phase (probably reverse faulting) and is characterised by unmineralised, banded, ferruginous quartz (Table 1). This initial veining is interpreted to represent the primary structural architecture. Subsequent reactivation of this structure has created dilatational jog positions which have been exploited by mineralised fluids. Several quartz vein phases have intruded during this reactivation and at least two of these phases appear to be mineralised (Table 1). The mineralised vein phases are lenticular in shape which limits their strike width and length. The dilatational jog positions occur randomly along the strike extent of the Eastern and Main Reef Prospects but generally at intervals of 100-300m. This observation was used as a parameter to assign tonnes and grade to interpreted mineralised positions under cover. The mineralisation comprises sub-economic to ore-grade copper mineralisation, occasionally containing elevated concentrations of cobalt and minor concentrates of tungsten and silver. The copper mineralogy is chalcopyrite and bornite at depth and malachite within the regolith.